Despite going 2-0 up in the first half, Peterhead had to settle for a 2-2 draw with Brechin at Glebe Park last night. 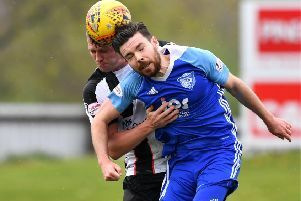 A injury time penalty from Bobby Barr secured a point for Brechin as Peterhead manager Jim McInally lambasted the decision to award the spot kick by referee Stephen Finnie. “We’ve been cheated at the end of the day. “There first goal the ball went a foot out of play in the build up and we should have had a throw in. “The penalty was the first time I’ve seen one given where the opposition didn’t claim for it, and even they didn’t know what it was for. “Football can be cruel, you try and take your blows on the chin but when the referee is inflicting those blows on you there isnt a lot you can do about it. Peterhead unquestionably had the better of the game in the first half, Gary McDonald taking the first chance of the match when his right footed effort from the edge of the box went narrowly wide of the far post. Brechin had chance through Paul McLean to break the dead before Gary McDonald got on the end of a Steven Noble corner after 17 minutes before clanging his header across the face of goal and out. Less than 10 minutes later though the same ball came in and the same man met it at the near post as McDonald scored his fifth goal for the club since joining earlier this year to give Peterhead the lead. Just before the half hour mark Peterhead doubled their lead when Brechin failed to properly clear a Cammy Kerr cross and Steven Noble came rushing to the edge of the box to strike the ball first time with venom, the shot looked destined for the bottom right corner which Brechin keeper Graeme Smith would likely have saved but a deflection off defender Gerry McLaughlan took the ball into the other corner of the net. Both teams had the ball in attacking areas and Kevin Dzierawski had the best chance for Peterhead when his 18 yard shot was saved by Smith after 37 minutes. With three minutes of time left before the interval Brechin found a route back into the game when Colin Hamilton connected with a Bobby Barr cross in space to volley home from inside the box. The second half was a much closer affair with fewer chances, Bobby Barr worried Peterhead’s Graeme Smith with a long range effort and substitute David Cox had a few good opportunities for the visitors. But it was in the 89th minute as Brechin pushed for a equaliser that Cammy Kerr cleared the ball off the line only as far as Darren McCormack whose shot went over the crossbar. However, almost inexplicably, the referee awarded a penalty for a push on McCormack after he had hit the ball. Bobby Barr stepped up to rifle the spot kick home off the underside of the bar. There was enough time left for both teams to get the ball up into each others halves but a last gasp winner never came. The result keeps the play-off race very much alive as every team has now played the same amount of games. Peterhead climbed up a place in the table with the point and go level with Dunfermline, four points off Brechin in fourth spot.